This decade saw unprecedented growth in the Handmaid ministries in Philadelphia. The Academy in Wyncote was adding a grade each year and students were thriving. In 1953, the sisters decided to begin a high school for girls and opened Ancilla Domini Academy in Germantown. Sisters Ruth Held (pictured left), Pilar Ymaz (pictured right), and Jane Anderson were some of those who brought alive the notion of “education in a warm, friendly environment” – a theme that still exists today. Several of the young girls who were students at ADA found their vocation through the influence of the Handmaids and entered their noviatiate. Sisters Kathleen Helbig, Gloria Petrone, Kayjoy Cooper, Julia Walsh, and Elizabeth McCoy were a few of those young women. Today, four of them continue serving in Handmaid ministries in Wyncote, El Salvador, Haverford, and Rome, respectively. The Handmaid legacy – most especially, their teaching traditions and their desire to promote the education of young women, was taking shape more emphatically. 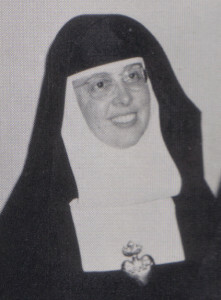 At the same time, the Handmaids, were compelled to share their “true love for Jesus in the Eucharist and collaboration with the desire of His Heart: the salvation of all people.” Their ministry expanded further and in 1957, they purchased the William Scull mansion in Haverford to begin a retreat center, Blessed Raphaela Mary Retreat House.